This sterling silver pendant displays tiny buds ready to bloom. It's approximately 1 1/2" x 1 1/2" with a oval dark warm-tone agate stone. Each piece is unique as it's handmade. Sterling silver 18" chain.Lynne Mossoian's contemporary jewelry is individually handcrafted from sterling silver and mixed metals. 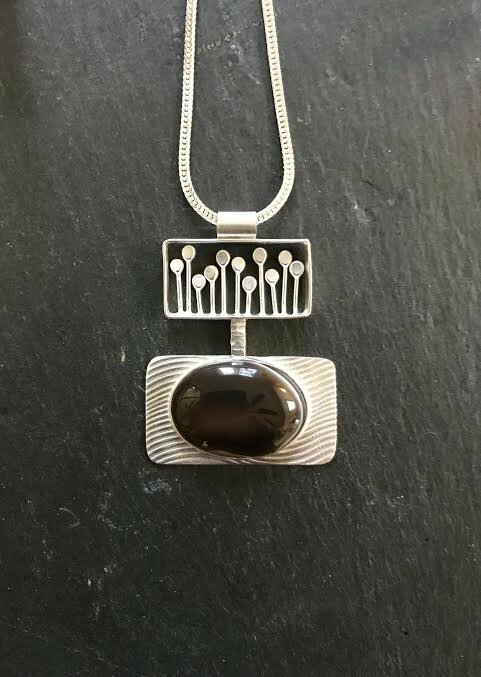 She has designed and made jewelry for over 20 years. However, it wasn't until her retirement as an educator that she expanded her metalsmith endeavors and opened Deer Creek Studio with her husband, Todd. The shape and texture of Lynne's designs are often influenced by nature and architectural elements. Her designs move from paper to her bench where they are hand-fabricated with the traditional techniques and tools of metalsmithing jewelry. Each piece is uniquely handmade, so there may be slight differences from the website pictures. She hopes you enjoy wearing her designs as much as she enjoys making them.